With winter approaching, Lisa took out her woolen clothes and hung them on the line. When a gust of wind carried her stocking away, an animal adventure began . . . Hedgie poked his nose into the stocking and it got stuck on his prickly head! Embarrassed, he tried to maintain dignity as he passed the mother hen, Gander, the barn cat, the farm dog, mama pig and piglets, and the pony on his way to his den. He was ready to be alone after enduring everyone’s laughter while he explained to each friend that his “new hat” would keep him warm, cozy and dry this winter. Finally Lisa caught up to Hedgie and rescued him by removing her stocking from his prickles while she laughed and exclaimed, “Don’t you know that animals don’t wear clothes!” But when she headed back, all her woolens were missing from the clothesline. . . and all the animals were wearing them on their heads! I can’t help but laugh as I think about how almost anything can be in style if you wear it with confidence! Jan Brett captures a cute story while weaving themes of curiosity, adventure, confidence, trend setting, and simply fun all throughout the story! Can’t wait to share the companion, The Mitten next! F- How did you feel or emphasize with Hedgie when he was embarrassed passing by all of his friends while wearing a sock on his head? R- Can you relate to feeling embarrassed like Hedgie felt? Can you relate to trying to appear confident even though you may do or wear something that doesn’t blend in or fit in with other people? I- Imagine you lived on this lovely Scandinavian farm pictured in this story. Look at all the details Jan Brett paints. What part of the scenery captures your interest most? N- Navigate through the incredible activities (games, printables, crafts and more) for The Hat at www.janbrett.com. D- Develop your own “new trend”! Design a piece of clothing for winter (on paper, with material or other crafty items) that you haven’t seen anyone where yet . . .at least not in the way you wear it. Be creative. Have fun! Please “Like” Kidsbook Friends on Facebook and subscribe via e-mail at http://www.kidsbookfriends.com to receive free kid-friendly book guides for great books! This entry was posted in animals, winter and tagged G.P.Putnam's Sons, Jan Brett, Penguin Young Readers Group, The Hat, winter books for children. Bookmark the permalink. 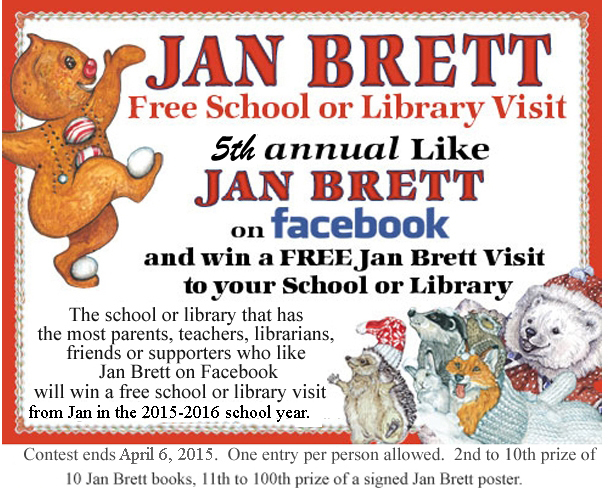 I love Jan Brett’s work! She is, by far, one of my favorite illustrators. She is the master at foreshadowing and I’ve been sharing her stories with my students for many years. There is really no one I could compare to her illustration style in picture books. ♡ Her voice exudes intricate details.